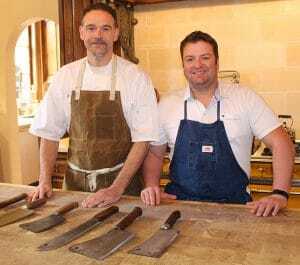 The Meatery is the brainchild of Jason Balestrieri and Kevin Hincks, chefs and master butchers committed to bringing the art and craft of butchery to the Monterey Peninsula. At The Meatery, we do things the right way. No compromises. Our animals are sourced from sustainable and ethically focused farms, local when possible. Every product we offer is created in-house—from hand cut meats and small batch charcuterie to gourmet sandwiches and seasonally inspired hot food. Chef Jason Balestrieri is largely known for his 10-year commitment, as Executive Chef/Partner, to Cantinetta Luca in California’s beautiful Carmel-by-the-Sea. It is at Luca where Balestrieri took the opportunity to display a true passion and skill for meat, cut, and cured in house. Before his tenure at Cantinetta Luca, Balestrieri served as executive chef at Nick and Stef’s Steakhouse and Pinot Hollywood, both in Los Angeles, and has also worked at such noted restaurants as Patina, also in Los Angeles. Chef Kevin Hincks began his career in Chicago, where he worked as Sous Chef at the Park Hyatt hotel. After moving to the Monterey Peninsula, Hincks and Balestrieri met at Cantinetta Luca, where Hincks began his tenure as Executive Sous Chef. Hincks and Balestrieri were not only productive partners in the kitchen; they became lifetime friends. Kevin Hincks later made a name for himself as an entrepreneur in the professional catering community, with his business Cuisine Concierge. During his recent stint as a stay-at-home dad to his three boys, Hincks developed a small following surrounding hand-jarred product, demonstrating a passion for gourmet accompaniments. True butchery is an old world art; a craft our butchers are passionate about bringing to the Monterey Peninsula. All of our meats are cut and hung in-house by our master butchers and our charcuterie is cured by chef Jason Balestrieri. You deserve to know where your food comes from. When you walk into The Meatery, to pick up your fresh cuts of meat or for our fresh, seasonally inspired hot food offerings and made to order sandwiches, you will be able to view our butchers at work. Glass windows provide you with a behind-the-scenes view of our entire process. There is a growing awareness that to know who raises, processes, and butchers your meat is to ensure you are buying the highest quality product. With over two decades of combined experience in the California and local food scene, our relationships with local ranchers allow us offer the most flavorful meats from sustainably and ethically raised animals. We are committed to sourcing ethically and sustainably raised animals. We offer grass fed, organic, and local meats when available.